I have many pages in my sketchbooks that I use to explore different materials or mediums. They are not finished sketches but exploratory tests. Some may be useful to others. This are a series of test sheets in Stillman & Birn Alpha landscape sketchbooks - my favourite for this sort of exploration. I love using a fountain pen to write and draw. I use a number of Lamy pens (as well as a number of other brands) and have had problems with damage apparently caused by Noodlers ink. So I started a search last year for a waterproof black ink. The German made and highly respected De Atramentis have a huge range of inks. In their Document range they have Document Black, Blue and Dark Blue, Red, Fuschia (Magenta), Turquoise (Cyan), Green and now Brown (update also violet, yellow, and fog blue-grey) that are waterproof once dry. They also have an Archival Black that has been tested under more stringent tests but appears the same as the Document ink. I have used both of these black inks in my Lamy Joy, Safari and Al-Star pens and they are wonderful. They are also excellent in a Sailor EF and a Namiki/Pilot Falcon EF soft (see a gorgeous video of a custom Namiki Falcon here.) 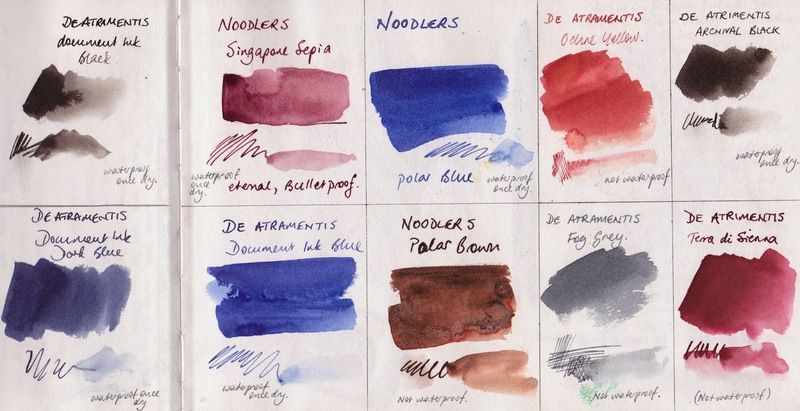 The Document Brown is wonderful - many brown inks are variations of reds and oranges rather than a true sepia or burnt umber brown like this ink - see Noodlers 'Singapore Sepia' below - which is maroon. You can see all the tests and mixes I have done if you do a search for De Atramentis in my blog. Below are the De Atramentis Fog Grey and Ochre Yellow so you can see them in more detail. I use these for drawing with in my Lamy pens. The grey is lovely to write with too but they are certainly not waterproof. The colour is still a bit bright for the Ochre Yellow but you can see it is not at all 'yellow' - much more of an orange. 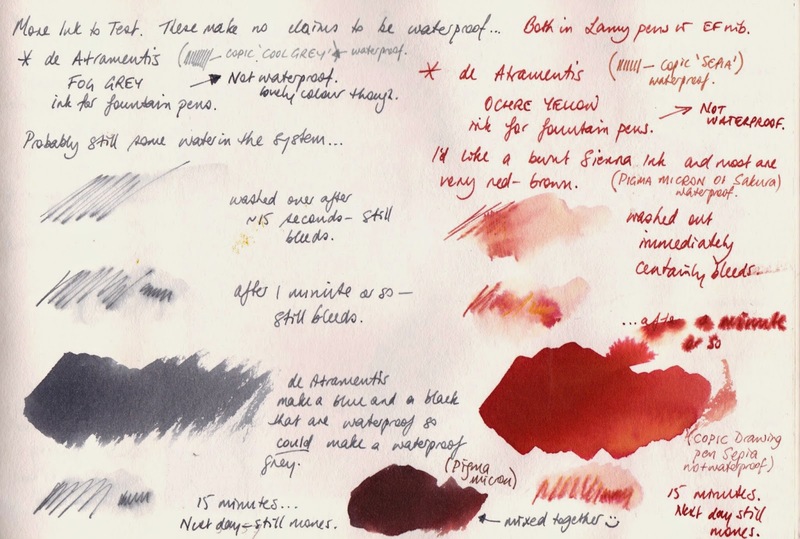 This page is testing the De Atramentis Archive ink in a Shaeffer pen. Dry after a minute. This is Sailor ink - a lovely Nano ink that is almost waterproof if you use a very fine pen such as the Sailor with the EF nib. In the Sailor EF the ink is applied very thinly so is more waterproof. De Atramentis is the most reliable though if completely waterproof is needed. 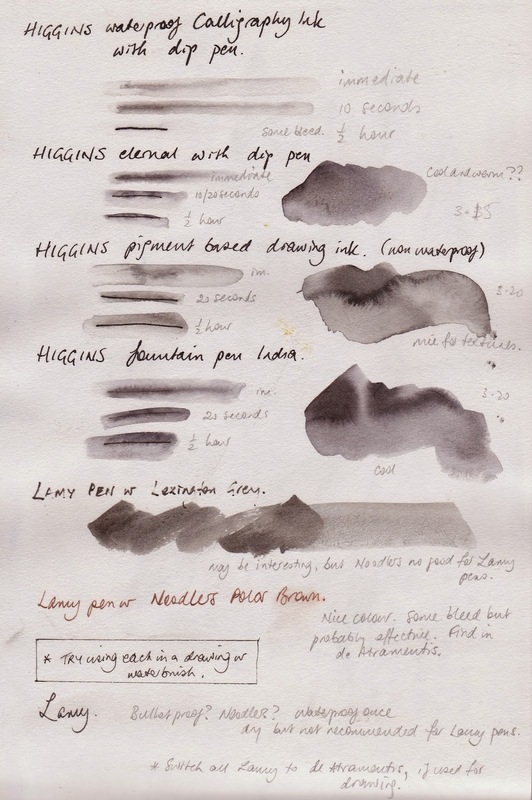 Below are some more explorations with Higgins Fountain pen India ink - non waterproof - and De Atramentis Fog Grey. I was testing them out for drawing - looking for an ink that could be softened with a wash. Curious why you haven't tried Platinum Carbon black ink as it's very nicely waterproof, and seems to be the go-to ink up here in the Pacific NW. Also, Noodler's No. 41 Brown is a nice basic brown which is waterproof. Many of my ink samples, etc, I get from Goulet Pens. Hi Peggy. I have seen that one mentioned on Facebook a couple of times so will give it a try as a sample some time - perhaps if Goulet Pens add Document Brown to their range :-) For now I am completely happy with de Atramentis Document or Archive as a waterproof black. I think it is fantastic that Goulet Pens do samples - ink names can be very misleading. My search for the perfect waterproof Burnt Sienna ink continues. Art Spectrum in Australia make one that is gorgeous but not suitable for fountain pens. 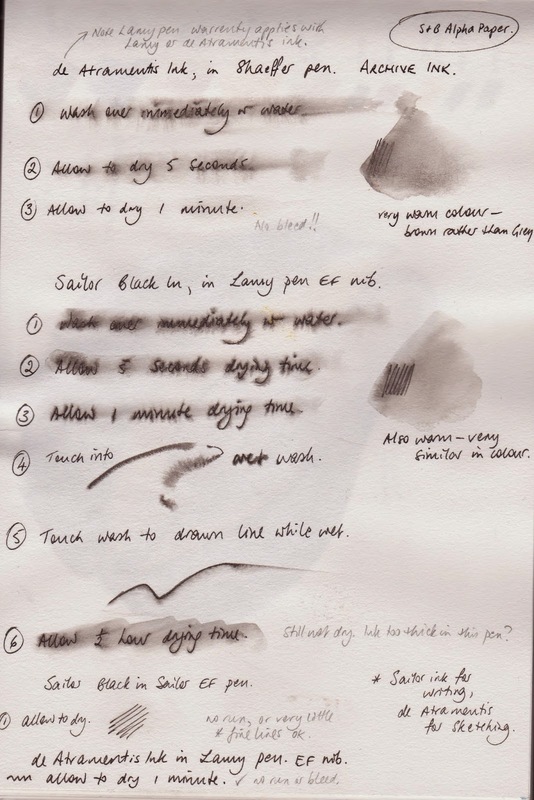 Jane, I'm curious what damage occurred with the Noodler's ink in your Lamy pens? I've been using Polar Brown with no trouble (and it acts waterproof for me) as well as 54th Massachusetts (dark blue black) and Lexington Gray. Sometimes one pen seems to seize up but I worked out a probably unorthodox solution - I just get a tiny bit of water on it (eg. dip briefly in water) and it is primed and flows again. Not sure yet if the problem is the ink (54th Mass.) or the pen (Konrad flex nib). My Lamy pen stopped working. I cleaned it out, flushed it and refilled it but couldn't get it to work again. I took it to a pen specialist and they asked if I was using Noodlers ink. They said it erodes the plastic of the feed system. another company has confirmed the problem. I took the pen apart and looked at the section and it was 'eaten away' a little. Apparently it is only Lamy pens and it may only be the bulletproof inks, but it happened to another as well that had coloured Noodler's ink so I just don't use Noodler's in my Lamys. I may have left it in the pen too long or allowed it to dry in the pen or something else that you are not supposed to, but I had to replace the whole feed section in one pen and the other is still unusable. 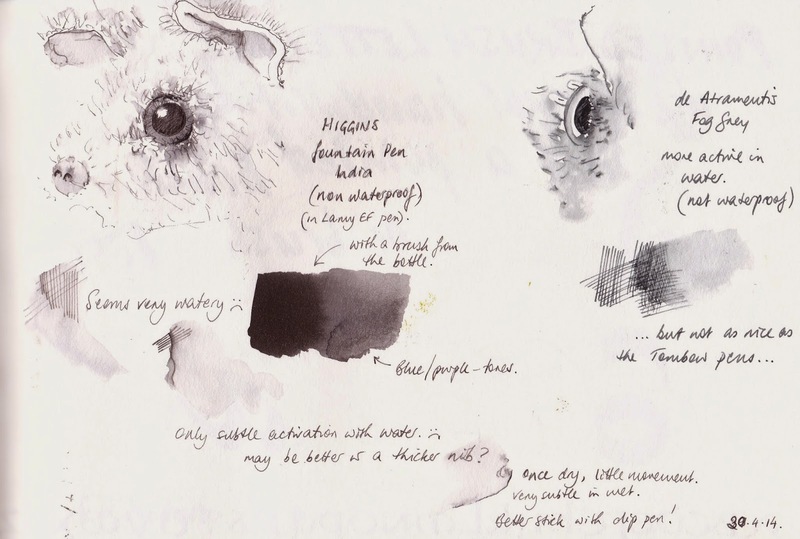 The Polar Brown is lovely to wash into while wet - all that amazing colour comes out - and a really nice colour to write and draw with. I'll use it with a dip pen. Hopefully it is fine with your Konrad - it's only Lamy's that seem to fight with it - so enjoy it. Thanks for the explanation Jane. It's good to know what issues may arise. Fountain pens are so complicated considering that they just have a few nonmoving parts! Hello Jane I'm wondering if you know if it's ok to use De Atramentis document ink with the Platinum Carbon Fountain Pen? Thank you for such an informative blog. As my chief concern was for a really good waterproof ink that flowed in the fountain pens, I haven't really worried about how black it is so that's a good question. I'll do a little test of the De Atramentis Vs Platinum Carbon - my expectation is that the carbon ink will be the blackest. It is available in a bottle so could probably be used in the Lamy (others have) though I haven't - I just use it in the Platinum carbon pen. I tend to work with fine and extra fine pens so the inks look very similar as fine black lines, and I trust the D.A. ink in the Lamy pens so that's what I use. You are always a wealth of great help! Thanks for your input. I look forward to hearing your test results. Thanks Jane. Using De Atramentis ink, Lamy pens should be cleaned more often than using regular inks? It's ok to clean it only once each month? I suspect they should be cleaned out more often, and yet Da Atramantis inks seem very 'clean' in the pen. I don't clean my pens nearly that often - I clean them when I change colours and if they stop working properly. Once a month is excellent. It would be interesting to check with Gouletpens.com whether they have advice on how often pens should be cleaned. I suspect that the more you use them the less often you need to clean them as they are kept flowing!